YAY!!!! I'm going to be the first person to make a post in this section! Last month I visited one of my mentors, Michael Hoover. He instructed me for 6 hours and taught me how to make my first knife scales with BC Boulder Creek Nephrite Jade. I am amazed at his perfectionism. He made a knife too and after showing me what to do with his knife, he paced patiently until I could get the same results with mine. Lot's of steps! I'm so happy with this though and the knowledge he gave is priceless!!! Thanks for taking some of your time to look at some of mine!!! Really beautiful jade knife. Great job on the polish. Jade can be a bear to polish. 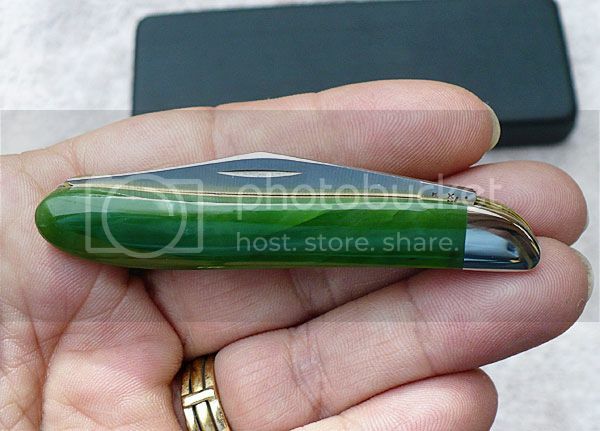 How did you get the high polish on the jade? Eric. I hope that's going in a display case Krystee because it's amazing and deserves a nice protected spot! Nova wheel 14000. Wet to dry!!! The strangest technique I have ever been taught but it works in literally a split second! Adjust the water so that only half of the wheel is wet. Start on the wet side and quickly pull to the dry side. And...... I mean SUPER quick with pressure!!! I couldn't believe that it polished to a glass finish in less than a minute if I didn't see it and do it with my own eyes and hands!!! Here is a link to the basics that Michael taught me. Granted, I had a few new pointers and tricks that he picked up since he originally posted this, but this is his public tutorial! AND......... Michael just got back to me! I asked him whether it was ok to talk about his secrets and he said "Yes! 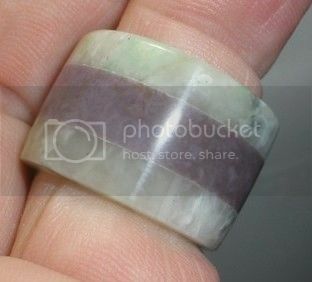 I have a jade polishing article on Ebay!" Because there is some good Jade info posted here I'm going to pin this topic. Don't want good Jade cutting information to disappear into the archives! Man, that knife just glows! Thanks for linking Michael's tutorial, that is a very cool thing. Somebody beat me to the comment, but I'm gonna repeat just because it deserves it! That is STUNNING!!!! And wow, thanks so much for including links on the polish, I can't wait to get into reading it. Thanks to you and Michael about the jade polishing technique. Once again, super knife. Thanks to Amanda for pining it too. Eric. And just so you mods know - you can also sticky topics too, it's not just an admin power. Thanks for showing this off. That's a real keep sake. Something to be really proud of. Good for you. You have talent. I tried to get folks on the old forum to try the dry diamond technique but I doubt anyone did . For Washington jade you often have to go much coarser. I have to start with the wet to dry with 600 grit and take it through 3000 before finishing with 14,000 wet. I wet the wheel with the bubbler then turn the bubbler on it's side to keep more water off the wheel then sand until the diamond is dry . A one second spritz of the wheel with the bubbler wets the wheel enough for another sanding session. this also works on some other undercutting stones. Some really good info here. I am sure it will help with my polishing. lithicbeads, Frank, what type of wheel are you using for the dry technique? I do not have much in the line of wheels so as I purchase them (probably one at a time) I want to be sure to get what I need for that process. All I have right now is carbide (or whatever the cheap ones are called), one 100 and one 3000 diamond soft Nova wheels. Several people have been extremely helpful in building up a good supply of jade so I really need to up my ability to polish it. I have no problem with the rings but flats and domes drive me crazy crazier. Wow, what a polish on that Jade. I will have to try that technique. It has been a long time since I posted in the knives after I did my first knife. I had so much fun and Michael had given me some tips on the material I was going to use so I took his advice and switched to Jade. He is a fantastic resource. I love the single bolster on the Case. I have looked since viewing and Michael calls them "barehead"? 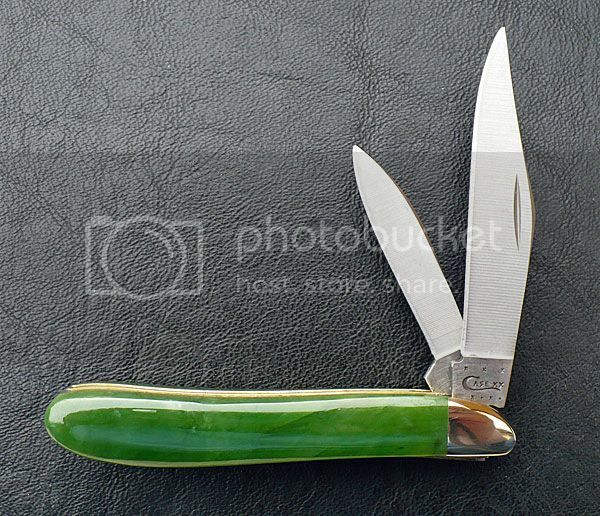 are these available or do you have to grind off the rear bolster of a regular Case trapper or Peanut? If you do grind off the rear bolster is it more critical in the cupping and grinding of the pin that holds the knife together? I like the look so much more that a double bolster knife and yours is a wonderful example of how pretty it can be. 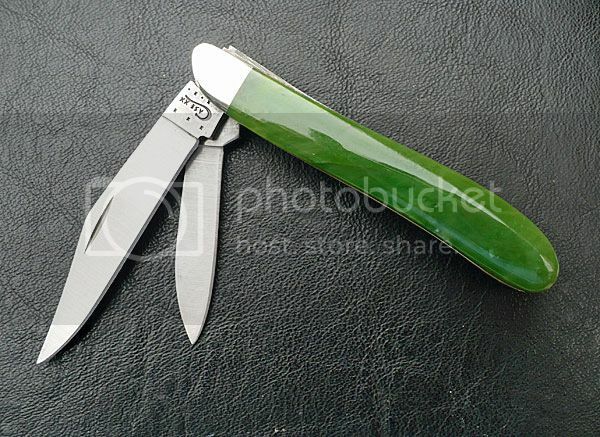 I've always liked case knives and jade. You put the 2 together and did a great job. Thanks for posting. can you wet to dry any other material hard material like agate? With Agate there is no need to wet/dry during grinding or polishing. The reason for doing it with jade it because of the fibrous nature of jade and achieving a better polish. Std grinding techniques work fine with agates.